"Don't Buy Any Pilates Video Until You First Watch This Fabulous New Production"
You're probably wondering why I'm literally giving you $63.95 worth of my very best fitness advice and health improvement information for FREE. It's because I'm trying to get you "hooked!" That's right. I'm shamelessly attempting to get you "addicted" to looking better than ever before, feeling energized and living healthier than you have in years…maybe ever! Look, if I can let you in on the workout that is sweeping the nation, toning and slimming more people than any other program PLUS give you a support system that will keep you motivated, on track, living' well and looking' hot…you'd be silly not to continue, right? Of course! Have you ever Rolled Like A Ball, performed The Frog, The Corkscrew or The Seal? Sounds like the fun games that kids play doesn't it? Actually these are just a few of classic movements you'll learn with Pilates Made Easy. And YES.…exercise can be fun WHILE helping you to sculpt the lean body you have been dreaming about. Pilates is everywhere but many people don't fully understand what is…let alone why it may be the one thing that finally flattens their tummy, tones their entire body and makes you feel better than ANY other workout. 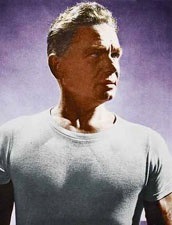 Pilates (pronounced pah- LAH- teez) was invented over 80 years ago by a German Immigrant to the United States, Joseph Pilates. It was a technique originally developed for dancers to help with deep body conditioning and injury rehabilitation. It involves a series of non-impact exercises designed to stretch, strengthen, and balance the body without adding bulk or stressing the joints. Hollywood stars like Madonna, Demi Moore, Jennifer Aniston, Halle Berry, Daisy Fuentes and Julia Roberts all incorporate Pilates into their routines…and by the looks of'em…it really works! But What Can Pilates Really Do For You? Would You Be Happy With Results Like These? "I've already lost 10 inches off my rear-end alone!" "50 years of back pain gone in just a few weeks... I still can't believe it!" "Your newsletter has given me a true education and what I appreciate most is the digging and uncovering you do to bring out the facts." "Now I know why I never saw the results I wanted, even though I was exercising five days a week for 2 hours at a time!" "My waist went from a 42 to a 36 in just 8 weeks and I lost 10 pounds of fat!" Creates longer, leaner muscles versus bulky muscle that can be obtained from traditional weight training. Improves postural problems and helps strengthen the back, not stress the back like many other forms of exercise can do. Increases core strength and stability allowing you to make more progress flattening your tummy and midsection. Heightens body awareness, which teaches you how to engage each muscle group, allowing you to get more out of each and every workout. Is easy on joints because there is NO impact versus most aerobic classes and high impact forms of exercise. Improves balance, coordination, circulation which improves your overall health and quality of life. "Pilates is like some sort of yoga or stretching and that you won't get a 'good enough' workout from it"
"It sounds too hard and I'm I'll probably just going to end up hurting myself or even worse going to a class and making a fool out of myself"
Well, if either of these sounds like you, you are not alone. Most people I speak with think one of these about Pilates but both are incorrect. Pilates Made Easy is perfect start for the beginner who is looking to ease into exercise but, it's also great for the advanced athlete because each exercise is presented with variations so no matter what your level you can benefit from each and every movement. If you are a beginner you will be shown the exercise at a basic level that will allow you to work at your own pace and stay within safe guidelines for your physical ability. 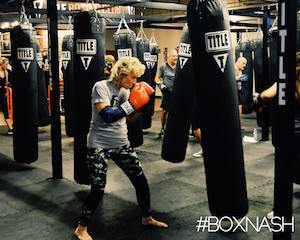 More advanced students will benefit from the intermediate and advanced teachings where they can really challenge themselves and reach that level of intensity that they want in a workout. And everyone benefits from the convenience of being able to do the workouts from the comfort of their own home when it's convenient for them. Come home late? No time for the gym? …Pop in the DVD and in 20 minutes you will be taken through a warm-up and 19 Pilates Exercises that are proven to strengthen, tone and energize. As a 10-year veteran in the health and fitness industry, I have never met anyone who couldn't benefit from Pilates. People pay well over a hundred dollars for a single Private Pilates session and a group session can be anywhere from $12-25 EACH! 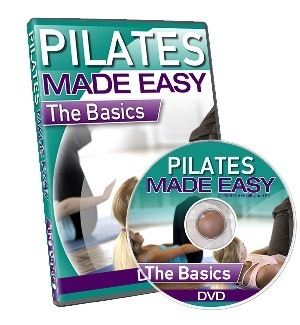 Now, I'm making it a real "no brainer" for you by offering you this Pilates Made Easy DVD valued at $29.00…FOR FREE! If you have always wanted to give it a try but didn't want to spend the cash this is your chance to save major bucks. I'm interested in giving you more than just a workout. I truly want to help you improve your overall health by keeping you informed about the latest in pain relief, health and most importantly…information to keep you motivated and on track! My team and I pound the pavement to find the best, proven, and relatively unknown news and tips to bring you each month. My full-length printed newsletter includes in-depth analysis and education, always on the cutting edge of health and wellness. Plus, you’ll always get easy-to-follow steps to help you return to a healthy, pain-free life. 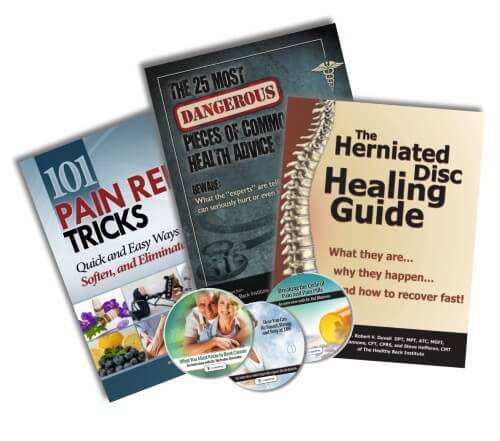 Readers of my newsletter regularly rave about the in-depth articles on conditions, treatments, product reviews, recipes, tips, and even how-to demonstrations available exclusively to members of the Live Pain Free family. Each month, I interview a revolutionary health and wellness expert, flying under the radar of media and drug-driven medicine. You’ll hear the truth that big pharma and the medical establishment won’t tell you… and actually try to keep you from knowing. I promise you’ll learn so much from these interviews; I learn something valuable in doing them too. You’ll get a full recording of our conversation – busting myths, sharing secrets, and giving you the knowledge to get back on the road to healthy, pain-free living. I’m so happy to share these with you each month. 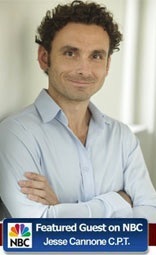 There’s so much that can help you on your quest for health that I just can’t contain it in a single monthly newsletter. So, each month, I’ll share extra bonuses in your exclusive, online members-only website. You’ll get in-depth special reports on a variety of health topics, bonus interviews, video examples of stretches and exercises, and more! 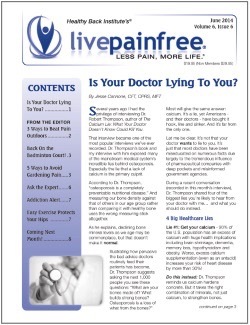 No other pain-free living newsletter comes close to the quantity and quality of content my members get each month in the free bonus archives. You’ll have immediate access to over 60 issues, and more than 40 interviews - all as a benefit of being a member of my Live Pain Free family. Latest News and Product Reviews. In spite of the best efforts of the FDA, the rogue medical community is advancing at a rapid pace. As a leader in the fringes of health and pain-free living, I’m tapped into the latest and greatest news and new products, and I share this with my Live Pain Free members as soon as I can. If you rely on the major networks or large newspapers to get your health news, you may as well still live in the 1950s. 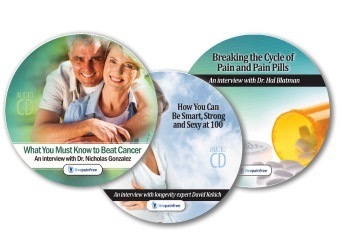 I promise to keep you up-to-date with the latest, promising, and proven advances that can benefit your life. Live Pain Free Success Stories. Over the last decade, I’ve received thousands of letters from successful customers. With the author’s permission, I share their stories of successful transition to a healthy, pain-free life. You’ll get inspiration from people just like you who have turned their life around. Plus, my commentary will help you apply their discoveries to your own situation. As a member, the door is always open for you to participate in my monthly, Live Pain Free members-only live Q&A session. Each month I make myself and at least one other expert available for a real-time discussion. Where else can you get your own, personalized consultation without a huge co-pay or deposit? 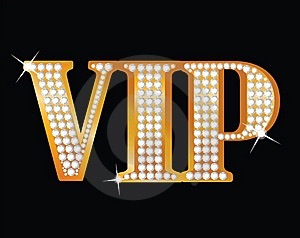 Members-Only VIP Sales and Product Releases. Members of my Live Pain Free family are the first to hear about new products and special discounts. I pledge to always offer you the first notification of new products from the Healthy Back Institute – and will always offer you the best deal I can. Plus, members even get to try some of the latest products for FREE! You’ve seen the special discounts on products and services from the Healthy Back Institute – just imagine what you’ll see as a member of my family! You Truly Do Become Part of My Inner Circle. I know, it sounds like a marketing trick, but I promise I mean it. Members of the Live Pain Free family have direct access to my own personal brain trust. You’ll have access to my own, personal email address, where you can get personalized support for your situation. But Is It Really Free? And If So, Why? If you're anything like me, when I see that big FREE offer I immediately put my "scam" radar up. I just wanted to address this right off that bat so there is no question in your mind. No, there are NO hidden costs or fees. All we ask is that you pay the shipping and handling which is only $6.95 US and $9.95 outside the US. Yes, you can cancel the newsletter anytime... NO QUESTIONS ASKED! No, I will not "sell" your email address to anyone else. I would never do that or associate myself with anyone who does. I just want to give you that push you need to finally get in shape or maybe just a new fresh workout that is going to get you past a plateau that has you frustrated. Either way, this Pilates Made Easy DVD and One Month Membership to my Get Healthy and Fit Inner Circle could be the difference between idling where you're at currently and achieving the body and healthy lifestyle that you have always envisioned. Look I'm not making money off this free offer (just ask my accountant) but I'm willing to take this hit in order to introduce you to what I know is the very best health and fitness newsletter that you will find anywhere. 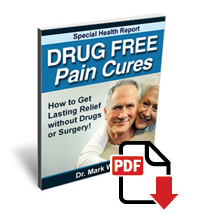 "So Well Written and Informative"
"Live Pain Free Reports On Things The Mainstream Media Won't Touch"
"Live Pain Free is an amazing newsletter. I enjoy this newsletter so much because you guys will report on things the mainstream media won't touch. Your topics are cutting edge and give information that big pharma doesn’t want people to know. And it gives natural remedies that doctors may not know about or they don’t believe will outperform their prescription drugs. The food and drug companies continue to confuse the consumer. These are the type of topics LPF tackles! Keep us informed! Keep up the great work!" If at any time, and for any reason at all, you decide you want to cancel your membership, simply call my office toll-free 800-216-4908 ext 2 ( INT 240-780-5977) or shoot me an email and we'll cancel your membership... NO QUESTIONS ASKED! Plus, you can still keep the free gifts, newsletters and CD/DVD's that you've received! 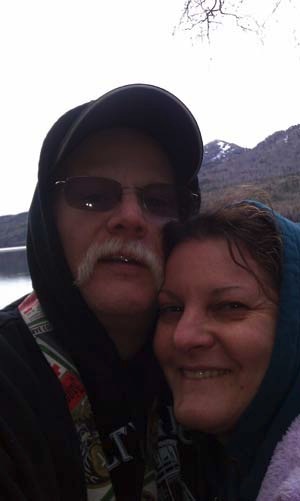 Again, no scams here, just an incredible FREE offer that is a total win-win for you! I wouldn't have it any other way! I Know You're Probably Wondering "What's The Catch?" I know you still may be scratching your head a bit wondering what the catch is. No catch. Just one of those rare times where you get a really great deal…and the best part is that this really great deal is going to improve your health, get you in shape and keep you that way for good! Don't miss out…you really have nothing to lose…except fat, inches and that extra weight that you have been trying to ditch. So click on that link above and you will soon receive your FREE Pilates Made Easy DVD, the Live Pain Free trial-membership and more. P.S. I URGE you not to procrastinate. This FREE offer is limited to the first 87 people to take advantage of this opportunity… When they're gone…they're gone! Note: If you order after they are all gone, we will promptly notify you via e-mail. Disclaimer: *The statements made regarding this product have not been evaluated by the Food and Drug Administration. The efficacy of these products has not been confirmed by FDA-approved research. These products are not intended to diagnose, treat, cure or prevent any disease. We are sorry, this product is not available to be sold in the country you are currently located. Please check out some of our other popular products in our store.